The bullish scenario that we described in January for the U.S. Dollar seems to be kicking in. 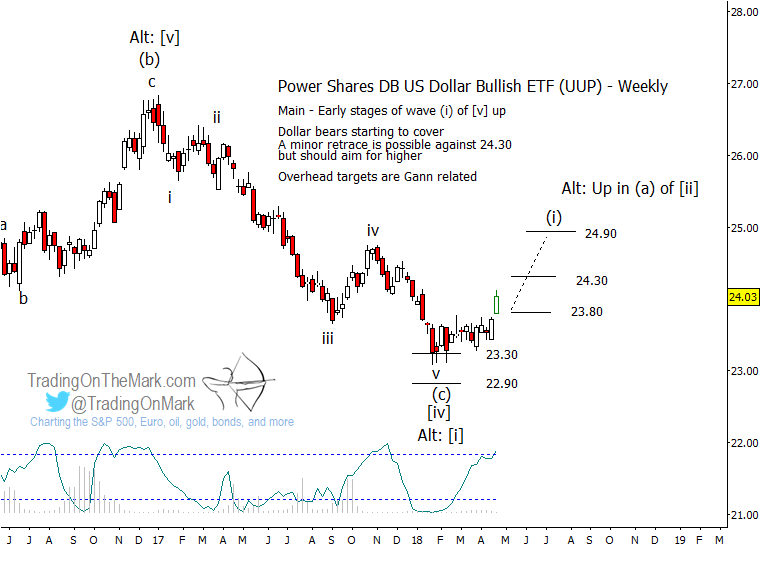 This post offers an update for the Power Shares DB U.S. Dollar Bullish ETF (NYSE Arca: UUP) with preliminary upward targets. Earlier this year we were watching for the completion of a five-wave structure down from the high that UUP formed at the start of 2017. Price found support slightly beneath the area we identified at that time, but the rapid bounce away from the area lends credence to the view that UUP has put in a durable low. Our primary scenario treats the decline from the 2017 high to the recent low as the final phase of a corrective pattern, with price now climbing in what should become an impulsive move to new highs. Meanwhile our alternate scenario considers the possibility that the same decline could be the start of a larger downward pattern. Either way, the near-term move should be upward, either as a new upward impulse or as an upward retrace of the decline. Price has already broken above the first Gann resistance level at 23.80. Using the same method, the next higher targets include 24.30 and 24.90. We will be able to refine those targets with Fibonacci and geometric methods after more bars have printed. Dollar bulls who are working on a weekly time frame should watch for opportunities on minor pullbacks, knowing that at this point the two scenarios described here call for there not to be any more “lower lows” in the near future.